Good food is meant to be shared. I have done a re-vist to Blacktail since this review. It was a much improved experience. You can check that out here. Cows like to chew cud. Celery: benign, watery, fibrous and crunchy. This stalky vegetable, a diet staple for many, isn’t something you see in high end cuisine too often. It’s a tricky item to incorporate into a dish. Celery’s texture and ability to absorb liquid are qualities a chef needs to consider carefully. Unfortunately, my meal at Blacktail Florist was hampered by celery. My colleague, The Distributor, and I decided to have a quick dinner at this new Gastown eatery before a show. Light coloured wood decorated the heritage restaurant, giving it an airy feel. The service was spot on, friendly and knowledgeable. Our meal started off well with nicely balanced Fawn cocktails, paired with salmon belly bites and half a dozen Royal Miyagi oysters. 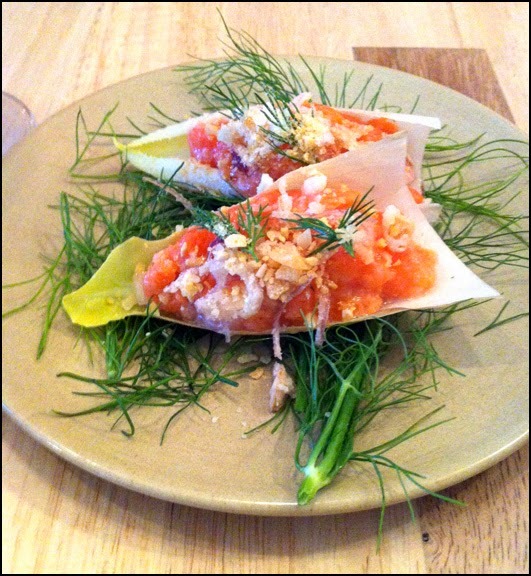 The salmon belly bites consisted of minced salmon belly, a texture similar to negitoro, served on endive cups, topped with fried shallots and pop rocks, and displayed on a bed of dill sprigs. The salmon’s fatty flavour worked well with all the other components. You occasionally got a pleasant contrasting hit of tangy dill, as some of the loose herb found its way into the bite. 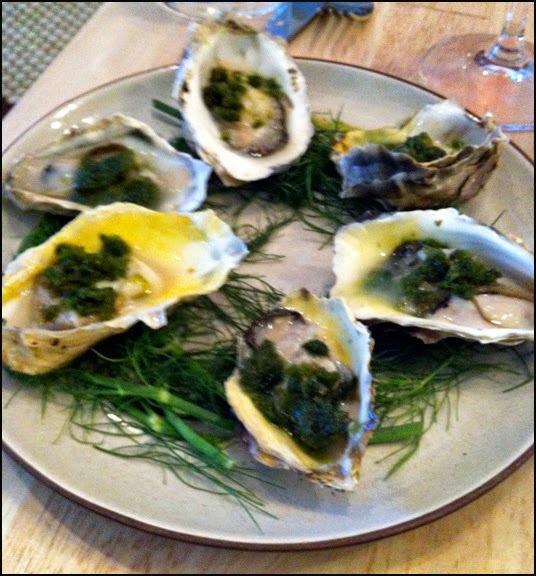 The oysters were topped with a spoonful of sorrel ice slushy, which yielded a green apple, i.e. sweet yet sour, flavour . The whole ensemble was tasty. Each slurped oyster provided sweet and briny notes with a clean aftertaste. Our only concern was that 2 of the rims of the oyster shells were fairly chipped. It didn’t make for a nice presentation and we needed to be carefully slurping the bivalve in those shells. For our mains, we selected the beef strip loin paired with a “head to tail” celery side, a grilled Humboldt squid served with a celery slaw and a squid ink aioli, and a morel mushroom topped mashed potato veggie side dish. Head to tail eating is a trendy concept. Unfortunately it was not a winning effort when applied to celery. The “tail” portion was a celeriac purée which was smooth, albeit a little salty. It went nicely with the perfectly cooked medium rare strip lion. The “head and body” part of the celery was simply a roasted half stalk of leafy celery. This roasted side was awful. The celery stalk was not prepped in any way, (i.e. stripped of its tough veins). As a result, with each chew a dense fibrous wad formed in your mouth. Basically you got a ball of cud, and it was a negative distraction to the meal. The Humboldt squid was also tainted by celery. The squid was grilled with skill. The tentacled seafood was soft and its subtle sweet flavour shone through. Then I had a bite of the celery slaw and the dish went down hill. The slaw contained thin slices of celery & rhubarb and was dressed with a vinaigrette dressing. Although I still got small ball of cud, the major problem was celery’s fantastic absorption ability. Remember that science trick in elementary school where you cut the bottom of the celery stalk and put it into dyed water? Within a short time the leaves and stalk of the celery took on the colour of the dye. In the case of our meal, some of the celery slices absorbed such a large amount of the tart dressing it felt like I was eating a crunchy pickle. 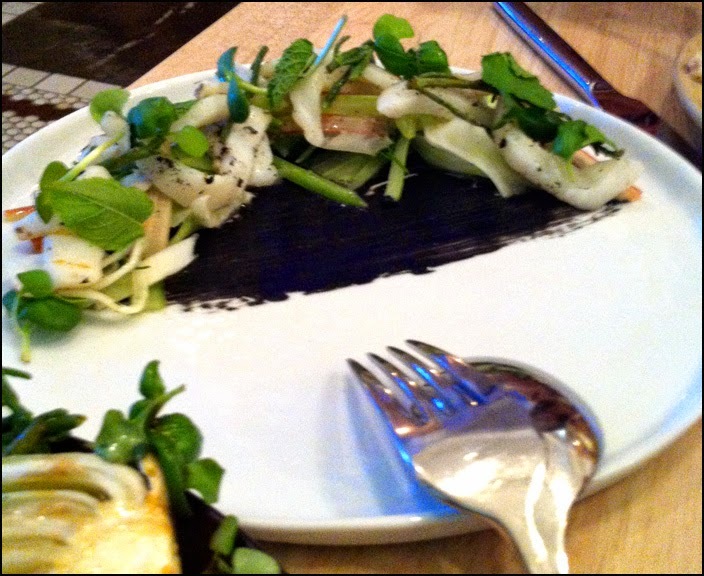 It was a jarring burst of sourness that overwhelmed the subtle flavour of the squid and briny squid ink aioli. 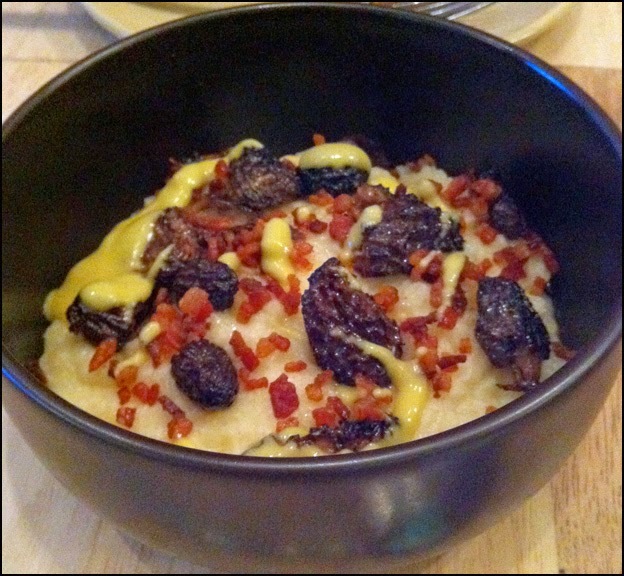 As for our vegetable side, you cannot go wrong with cheesy mash potato adorned with morel mushrooms and bacon. This was tasty but also verging on being too salty. 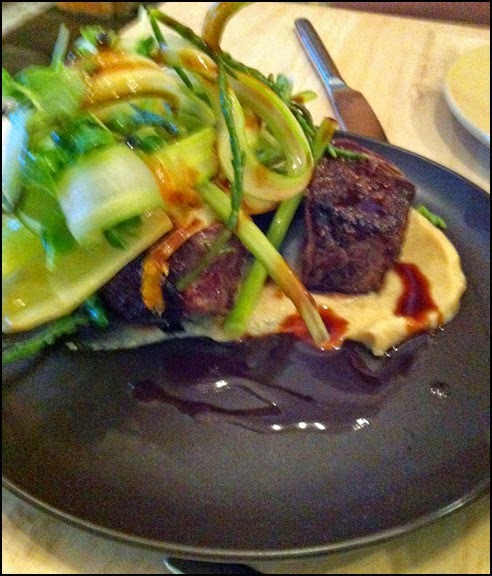 Generally, The Distributor and I both felt the strip loin and mashed potato were seasoned a bit too aggressively. The salt theme continued with our dessert. I’m not a big fan of Chinese desserts because of the common use of lentils and tubers in them. So when I spotted sweet potato as an ingredient in Blacktail Florist’s smoky dessert, I was curious how a non-Asian eatery would handle a tuber in their dessert. The smoky dessert consisted of mainly sweet potato custard topped with dollops of cranberry compote and mini spirals of whipped smoked crema. The server also presented a small chalice filled with salt flakes. He suggested sprinkling some salt to help balance out the flavours of the dish. We tried the dessert unsalted first. 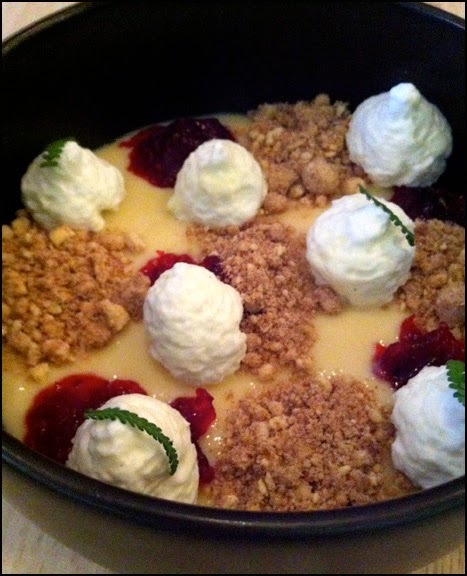 Each component had a very unique bold characteristic: the custard was sweet, the compote was tangy and the whipped crema had a bacon-esque smokiness. Without the salt I didn’t feel like the item was very harmonious. Each part of the confection had a flavour that clamored over one another trying to vie for your attention. The salt made it worse as it heightened each clashing flavour. The salt itself created its own problem as well. In parts where too many saltine flakes gather, the bite taste like a salty funky textured bacon mash of some sort. We should have stuck with chocolate and followed my general rule of thumb: no good comes from lentils and tubers in desserts; so don’t order it, except for maybe taro. Overall both The Distributor and I were disappointed with our meal at Blacktail Florist especially given our bill was $100 plus. The service, cocktail and salmon bites were great. However the poor choice and execution of the sides that came with the protiens, overall saltiness and lack of cohesion on the dessert marred our experience. There definitely is a high level of skill present on the execution of the proteins, especially the squid. Based on other the positives like the salmon belly and service, I would consider returning eventually, especially if they remove celery from the menu. Weaving a personal story of food and beer in Vancouver, BC. Food & restaurant reviews with teeth.